I wanted to share some altered art using an embroidery hoop and the beautiful Sunshine Bliss papers to make a decoration perfect for any home. 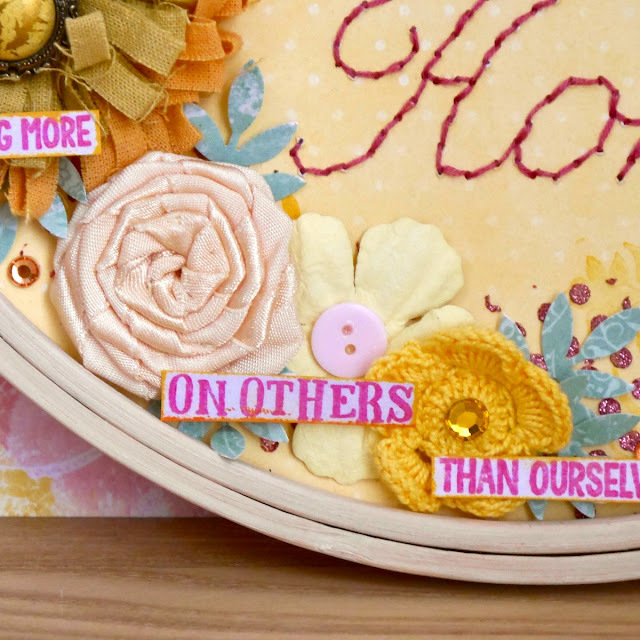 There are lots of layers to this project, I started with Sunshine Bliss as my base, roughly cutting it to size and then I used some of the orange Vicki Boutin stamp ink from set 2 and teamed this with the Fanciful Flourishes stamps. 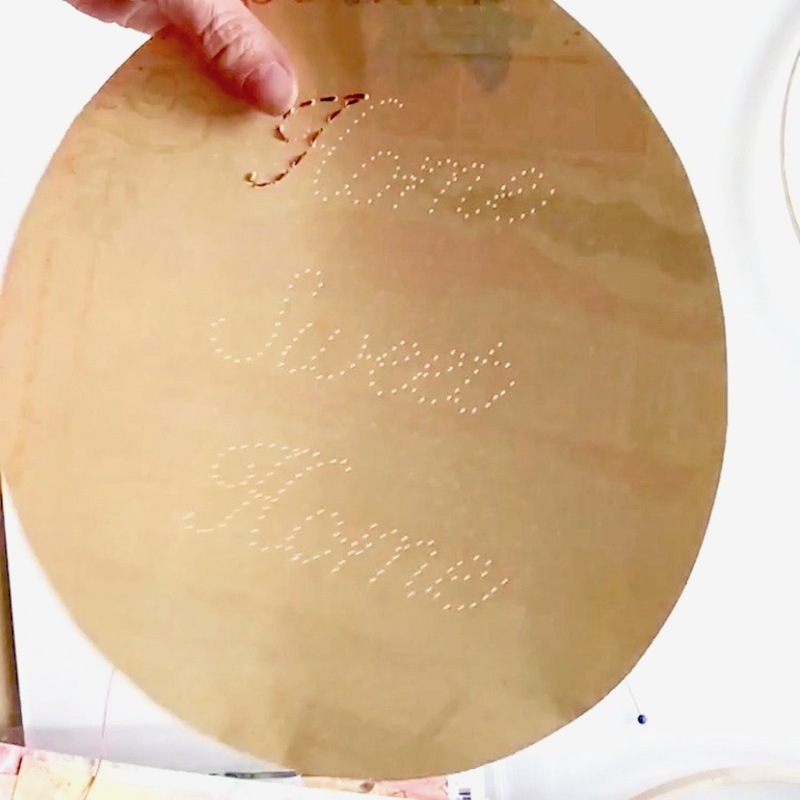 I added some Blush Glitter Paste using the Lots of Love Stickable Stencil and then set to work on the embellishments. I find the easiest way to stitch words is to print out the phrase in your font and attach it to the paper using some washi tape. Then using a foam base pin prick the words through the paper. Once this is done the stitching is easy - I used 3 strands of embroidery thread. I used lots of blossoms using some from Buttercup Bouquet and some from Natural Earth and Buttercup Dahlia, and I added punched leaves from the Serene paper. I added a few more words using the new Expression Stamps and mixed up the colours with the Vicki Boutin inks - I trimmed the print so I could add it amongst my flowers - the phrases in this set are beautiful. 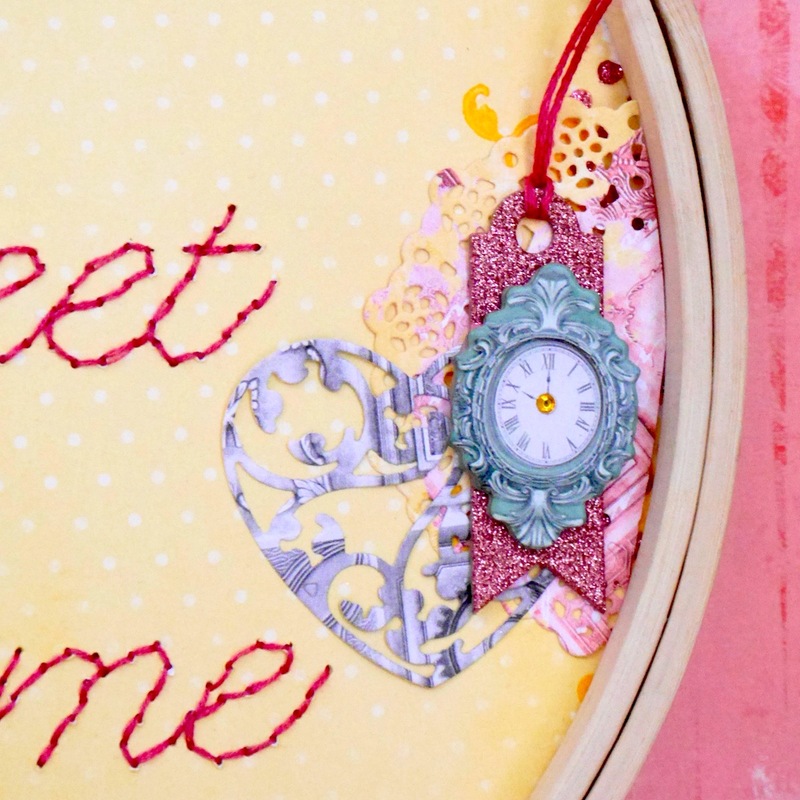 I also added a few die-cuts - here you can see the Sweet Heart and Darling Doily dies as well as one of the elements from the layered chipboard. Again I replicated the glitter paste and a little bit of stamping on this side of the hoop too. I hope you've enjoyed the hoop, they make a great gift! Papers: Sunshine Bliss - Sunshine Bliss, Serene, Felicity and Charm.